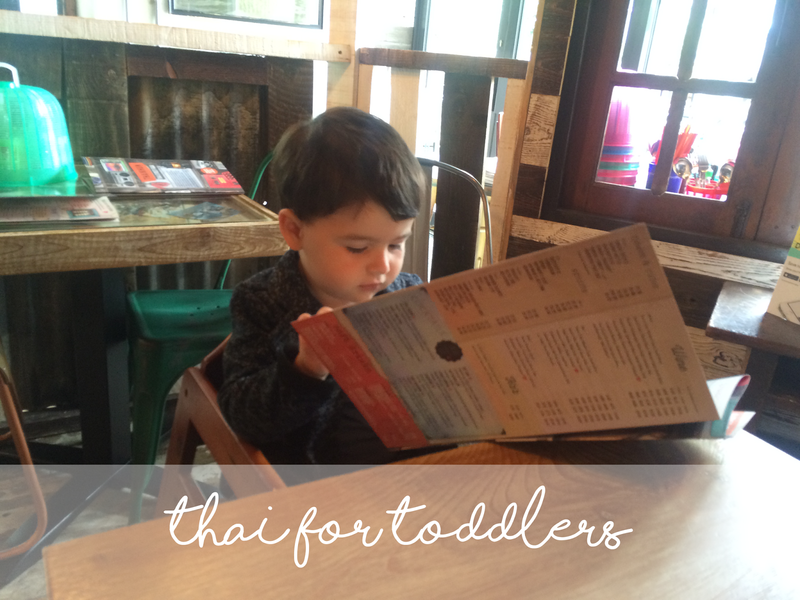 Recently we were invited to a really fabulous Thai Restaurant called Thaikhun, They've got a few branches across the UK, from Aberdeen all the way down to Guildford, we visited the Nottingham Restaurant, specifically to sample their brand new children's menu. As lovers of Thai food, but often skipping past any such restaurants due to the lack of options for Noah, we were really looking forward to seeing what they had up their sleeve. The first thing we found incredibly refreshing on our visit, was that Thaikhun had quite a few families with young children in dining. It was a quite day, as our visit was during the midweek afternoon, but we were so pleased to find we weren't the only ones eating with a youngster in toe as it can often receive a few eye rolls from fellow diners if you're sat nearby. At Thaikhun we need not have worried though as we had our own table with a little hut around us, we felt like we had so much space and were a little more secluded had Noah decided to present us with a little toddler tantrum. I may add their decor is beyond anything and it really does feel like you're in Thailand - until I look outside at the grey sky and am swiftly reminded exactly where we are. Immediately we were greeted, and even on the way to our table Noah was receiving high fives and chatter from the staff, which was so lovely. It was completely refreshing to visit a restaurant where a toddler didn't seem like an inconvenience, which is so easily done these days. Within around 5 minutes of being sat at our table, Noah was given some carrot and cucumber sticks to snack on, which is genius as it gave us that little bit of time to study the menus - which as there are so many great dishes, it does take a little while. Thaikhuns children menu is fabulous, it has a pik'n'mix feel, as you can mix and match what you want to tailor to your childs needs. So if he'd like BBQ sauce with beef and noodles he can have just that, or he could swap the noddles for rice - you get the idea. It's perfect, and even the fussiest of children would definitely be able to find something on their menu. We chose chicken and rice with sticky BBQ sauce for Noah, and when it arrived we were very impressed. They serve their childrens food on divider plates, it almost reminded me of retro school dinners, and although not an issue for Noah I did think it would be really useful if your toddler wasn't to happy with certain aspects of their food touching, it's all completely split up and you can choose to mix it together if you wish. I even tried to take a peak if I could see where the plates were from as we were truly that impressed with them. The taste test was passed with flying colours, as Noah managed nearly the whole portion of his scrummy food - and I know had we been to a similar Thai restaurant that didn't cater for children the way Thaikhun did, this wouldn't have happened and we'd have just paid for a meal that he really wouldn't have liked. The dish was simple yet delicious, which is exactly what toddlers need. For pudding, which lets face it, it was the part Noah was probably most excited about, it was a Mini Milk. Again, absolute genius. What child doesn't enjoy an ice lolly? And in such the humid heat, it was perfect. It kept Noah occupied again so me and John didn't have to fuss over him, he was so content just sat having a good old feast. Overall Thaikhuns childrens menu completely exceeded our expectations. Noah was truly catered for which was lovely, and that made sure we got through the whole hour and a half without a much anticipated Toddler tantrum (lets be honest, they're regular occurrences these days). From the decor such as the little hut we were seated in, which Noah liked to pretend was a house of the three little pigs, to Noah receiving stickers and colouring books, everything at Thaikhun was centred around little ones and that made Noah extremely happy and content, and a contented toddler is a happy family.